We have a dumping ground. Sadly that dumping ground just so happens to be the room we one day want to be our designated guest room and so at the moment we’re not terribly welcoming to anyone wanting to come and stay. We don’t even have a bed in the room yet – shame on us! There’s a lot of work that needs doing in this room, and whereas with some of the other rooms we don’t really need to replaster unless we’re being ultra fussy, the spare room has a couple of holes in the wall and so much bubbling where paper on paint on paper on paint has popped up off the wall, it does need a major overhaul. We need a new floor which means ripping out all the existing built-in wardrobes, a new ceiling and to bash down all the plasterboard that’s been built around the fireplace to house a TV on the wall which was left behind. 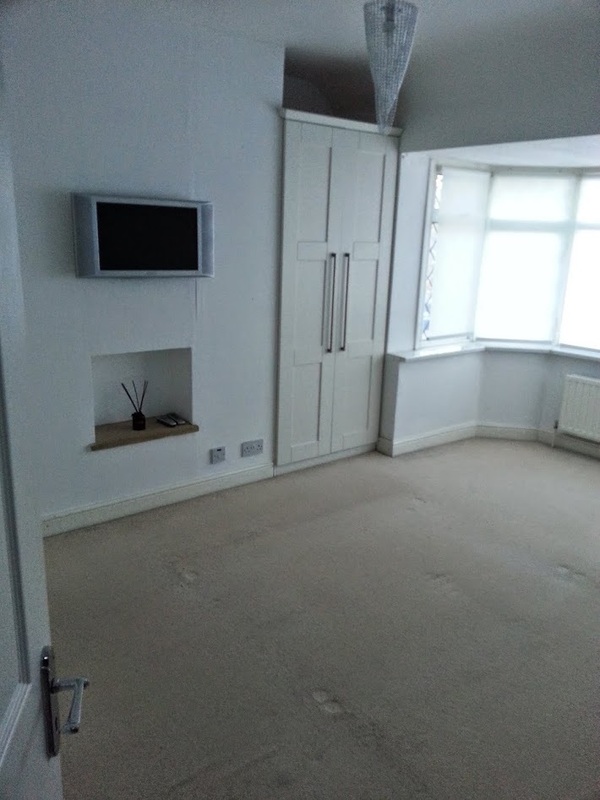 It actually doesn’t look too bad in this piccie but the carpet is so dirty, the wardrobes are quite rickety and it bothers me they don’t go all the way up to the top, all that happens is that dust gathers on top. You can see how big the chimney breast is because of all the extra boarding up. 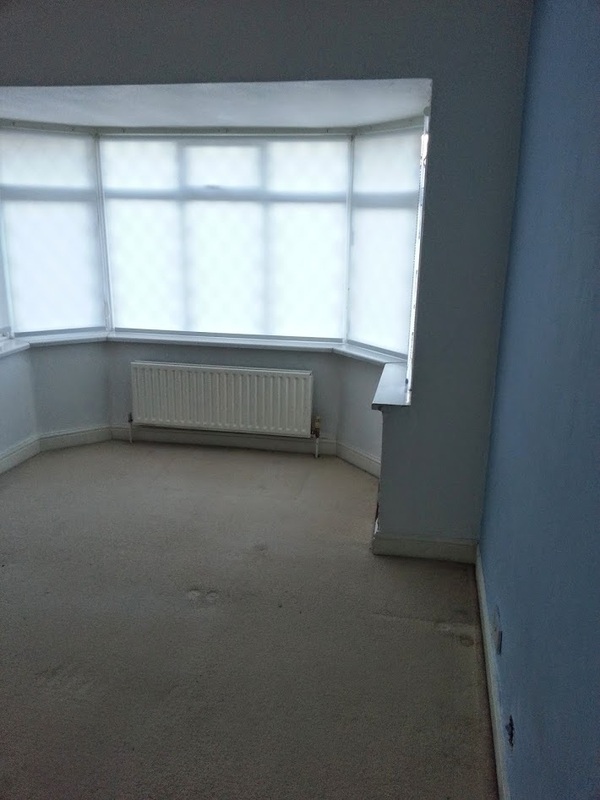 The skirting boards which were once white are now yellow. It’s just hideous. 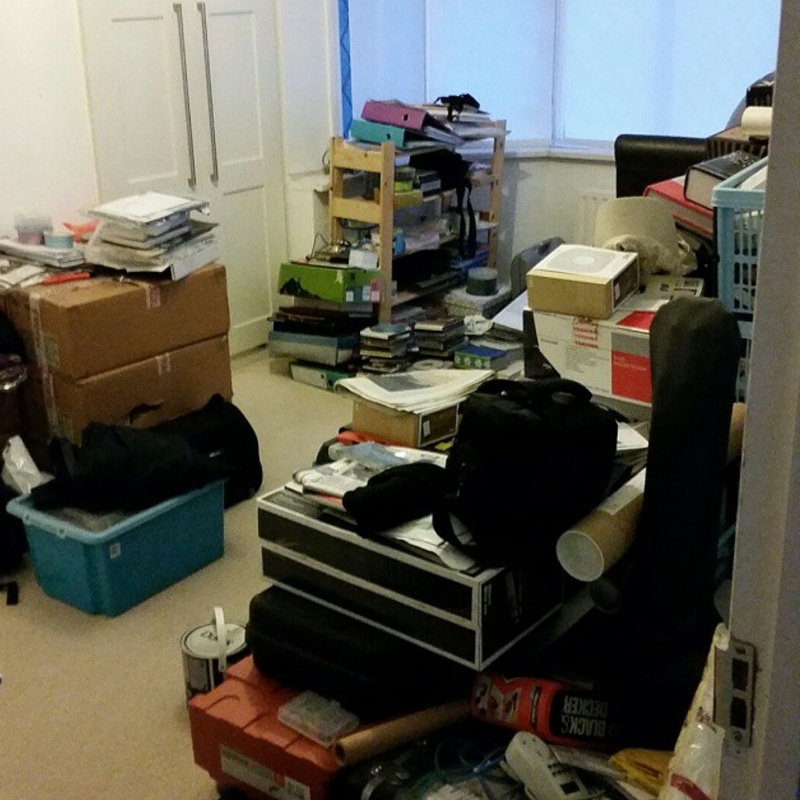 To be honest there’s a part of me that’s quite excited about the prospect of getting my mallet out and trying to learn some new skills along the way but it’s also hard to know where to begin and whether we’ll even have the money to tackle this room along with all the other plans we have for 2016. And then we moved in and it just became the place to put everything. Literally. Everything we didn’t know what to do with (actually I lie – mainly all Pete’s junk) went in here. I’m still amazed that between us we’ve managed to fill a 4-bedroom house and a double garage and a big shed with “stuff”. How did this happen? He did make an effort to clear it out before the window fitters came earlier this year so now you can at least get in and out and we use it as a laundry. The windows have been replaced, along with the window sill which was plastic when we moved in and is now wood, and the plantation shutters have been fitted so we have made a start at least. At the moment I think I’d like this room to end up quite feminine and whimsical which will probably be quite different from the rest of the house. I’d love to take out the wardrobe closest to the window and replace it with a chest of drawers and pretty mirror in the alcove. Some fun wallpaper as a feature on the back wall as you go into the room, with the rest of the room painted in a soft pastel colour. 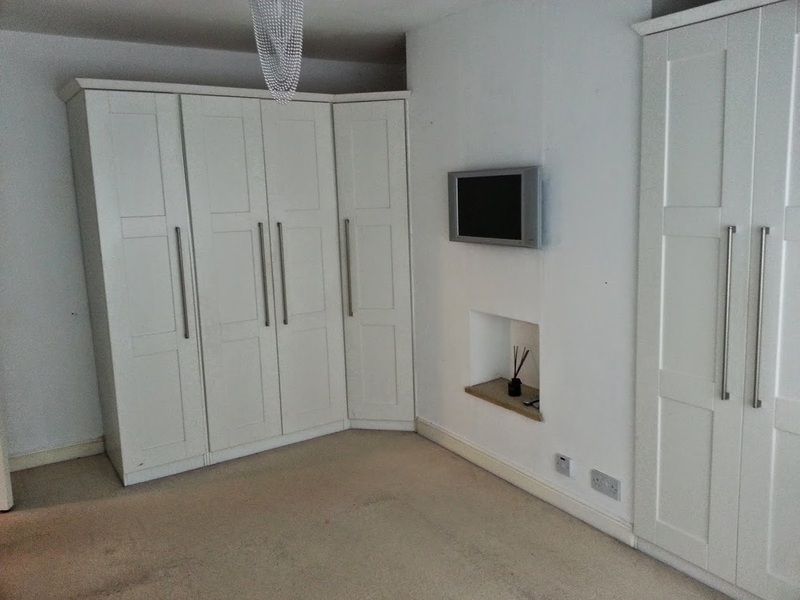 The existing wardrobes would be replaced with full-height fitted wardrobes offering better storage, and it would be lovely to replace the carpet with the same flooring we had put in the office. As a home of animal lovers carpet is neither practical nor hygenic, I feel like I’m constantly trying and failing to get dog hairs out of carpets! A double bed with little bedside tables and a comfy, casual chair by the window as a finishing touch and it would be the perfect room, I’d love people to come and stay and feel welcome, or, if I do need to escape Pete’s snoring I can do so in style 😉 Right now all we have to offer is the sofa bed in our third bedroom surrounded by stock for DaisychainBaby so I can totally understand why we don’t have visitors knocking at the door. Is it all a pipe dream? I hope not, just like everything else I know we’ll get there one day. 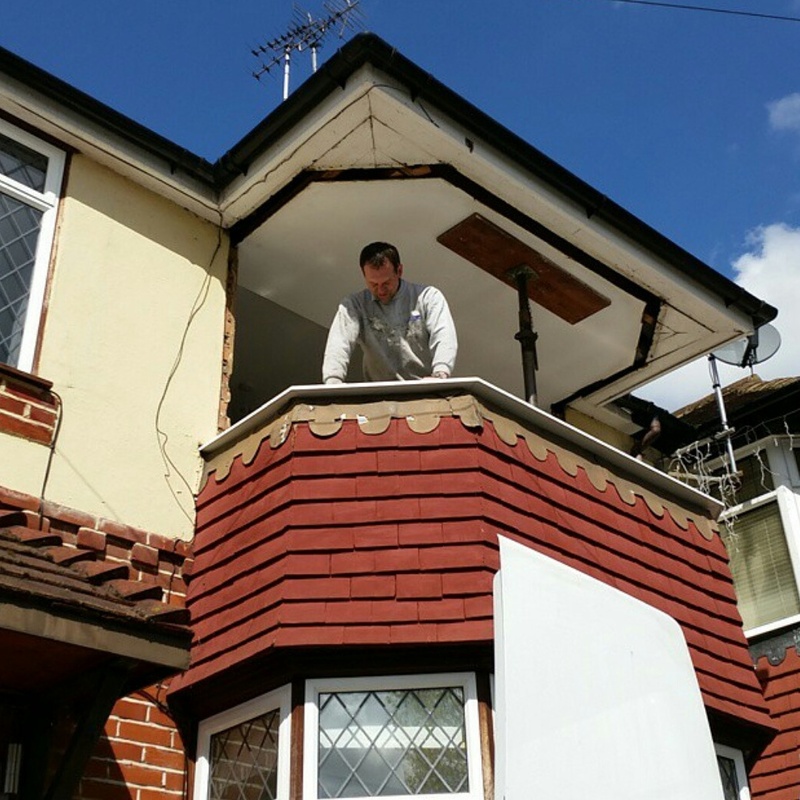 Do you have major room refurbs waiting to be undertaken? What’s your spare room style? That’s a gorgeously sized room for a guest room. I think sometimes decorating forces you to find somewhere to put all the ‘stuff’ that you don’t like – or to get rid of it. I love the idea of a really feminine room, I’ve done something very similar in our guest room (although it’s not finished yet) which doubles up as an office for me, as the rest of the house is all creams, greys and blues. The room defintitely has a lot of potential. Our guest room is the only feminine room in our man-heavy household. It doubles as my sewing/crochet/craft room and is full to the brim with “stuff”. It always needs a clear out before guests arrive. Good luck with transforming your room. I’m sure you’ll make a beautiful job of it. Your plans sound great. Hi from Munich (just arrived! ).